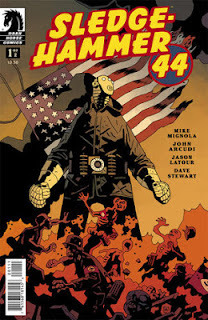 The Fellowship was fortunate enough to obtain a copy of SLEDGEHAMMER 44 #1 from Dark Horse Comics. Mike Mignola and John Arcudi write and Jason LaTour draws. We’re in France in 1944, and our practically anonymous infantry unit is on backup duty. Only they don’t know why, at least not until the explosion. That’s when the metal guy shows up and starts tearing through the German defenses, until he hits something big like him. Then the backup unit takes over, and runs into trouble on the trip back to base. This book has a gritty realism to it, which is not surprising to Mignola fans. We may not know the names of the guys in the unit, but that doesn’t make them any less real. And the metal guy is a puzzle – to us and to the unit. The unit guys are clever, though; the wheelbarrow is a great idea, and they even manage to not be surprised when they’re betrayed. And I love a well-drawn black-and-white comic. This is yet another quality outing from Mignola and company. And it’s fun to see a WWII era adventure, too. Check it out. SLEDGEHAMMER 44 #1 is available now at your FLCS or by order at darkhorse.com.